The third single from "Minor Earth | Major Sky" was released to radio stations in Germany (and in other European countries such as Sweden, Switzerland and Holland) in September 2000 and was released to German record stores on 6th November (one week later in other parts of Europe). Originally, "The Sun Never Shone That Day" was to be released in Norway instead of "Velvet", but it was later decided that "Velvet" would also be released in Norway. The German made 1-track promo single features a slightly edited version of "Velvet" (4:01). It comes in a wallet style card sleeve. The print used in the background of the sleeve (front and back) is by Magne Furuholmen with red being the main dominating colour. A large white outlined a-ha logo has been placed on the left hand side of the sleeve, above the centre. 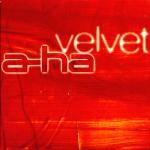 "velvet" is printed in white large letters just above and to the right of the a-ha logo. The reverse of the sleeve shows more of Magne's print with the title in large white text at the top and other white text below. In the bottom right hand corner it reads "For Promotion Only" and gives other copyright information. 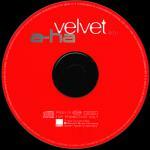 The disc is red with silver a-ha logo and white titles. 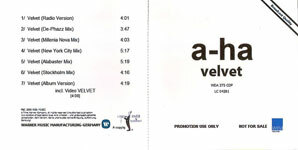 The a-ha logo and title are printed at the top of the disc, in a similar fashion to how they appear on the front sleeve. Some copies of the German promo come with a wea records press sheet with information on the band, German tour dates plus TV appearances. The regular edition includes seven different mixes of "Velvet" and the first 20,000 copies available in Germany also include the video for "Velvet". The black sticker on the front of the case indicates that it features the video version "inc. new video velvet", however, it is thought that the version without video was never actually pressed. There is a German acetate version of the seven mixes single. It comes with a white stiff paper folded insert with titles printed in black on the front and the tracks listed on the reverse. The catalogue number, "promotion use only not for sale", "Broadcast Quality" and a blue wea records logo are also printed on the front. Copyright information plus the "master & servant" logo are printed at the bottom on the reverse. The disc is plain silver without and titles with just the catalogue matrix number 857385751-5 and WEA logo pressed onto the centre of the disc. 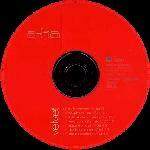 Sweden: Again there was a 2 track CD single, it features the "Radio Version" and "Album Version" of Velvet.